Well, I'm now firmly into my mid-50s. That's right - I just turned 55. For those who remember the roll out of the National Maximum Speed Law way back in the 1970s...that's kind of how I feel - seems like someone is trying to slow me down! I may even qualify for the senior discount at a few places. How did this happen? But what does the speed limit have to do with staying young? Not much, but I thought the sign was a cute addition to this post. What I really wanted to share is a cool thing I thought of that anyone can do to help them stay younger. I recently watched a physical therapist do an assessment of an 83-year-old woman and was impressed with how much he could tell about her condition just from feeling her spine. No x-rays, no scans, no nothing - simple touch. How non-invasive is that? Anyway, it got me to thinking - might it be smart to have an assessment now, while I'm young enough to take some corrective action if I have any problems brewing? Why wait until I'm actually old to find out I could have prevented some pain and immobility? Do I want to be confined to a lift chair? Do I want to use a walker? No! So I made an appointment and had a full assessment done. Happy Birthday to me! The results were surprising. It seems I stand a little crooked - kind of lower at the left shoulder with my head leaning slightly to the left and forward. I also have some hip issues. So what to do? Well, it's surprisingly simple - a few easy exercises for the hips and some posture work in the mirror. There were several other suggestions, as well, that I will incorporate into my daily routine but the biggies for avoiding problems down the line are the posture adjustment and hip exercises. When you call to make an appointment, don't be surprised if they don't have a clue what you're talking about. I know my local physical therapist didn't, but he thought it was a great idea. And yes, you can refer yourself - at least for just one or two visits. And yes, you'll probably have to pay for it yourself (my 1.5 hour appointment was $96) but it is well worth the cost for the physical therapist's expertise. So get on the phone now so that you can find out how you can avoid problems in the future and stay as young as possible. Trust me - you want to do this! Happy Birthday, Crystal. 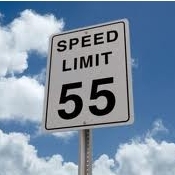 I'll be joining the 55 MPH speed limit in a few months. Sort of can't wait until I can get a discount at a few of the local restaurants (LOL). Making an appointment with a physical therapist is a good idea. What I like about physical therapists is they teach you how to heal yourself through exercise. I've found that when I start to feel a little out of sorts, it's because I got lazy with my exercises. Once I get back to exercising, things improve. At our age it's best to be proactive. And Happy Birthday to you, Felicia! I thought 55 might finally be a tough one for me but it just breezed by like all those that came before. I'm really excited about the suggestions from the physical therapist. The focus on self-healing through targeted exercise is refreshing, especially when compared to the idea of prescription medication that just masks symptoms that could be eliminated.